Tidal simulations for the Isle of Wight, the Solent, and Cowes Harbour are shown in the video animations below. 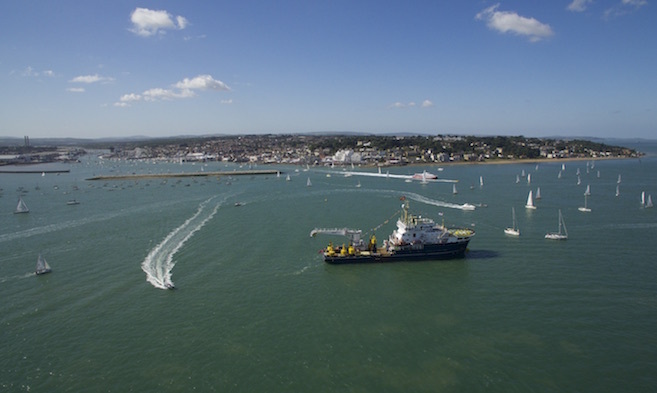 These tidal simulations are taken from the new hydrodynamic model of the south coast and Solent, developed by marine consultancy ABPmer, and illustrate tidal patterns in and around Cowes Harbour and the adjacent waters of the Solent. Isle of Wight Tide - ABPmer. Numerical tidal simulation of the area around the Isle of Wight. The animation illustrates a representative spring tide. Higher tidal flow speeds are shown as lighter colours. The water level plot shows the water level as predicted for Cowes. 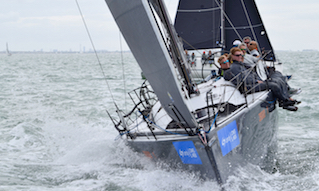 Cowes Solent - ABPmer. Numerical tidal simulation of Cowes Solent. The animation illustrates a representative spring tide. Higher tidal flow speeds are shown as lighter colours. The water level plot shows the water level as predicted for Cowes. Cowes Outer Breakwater - ABPmer. 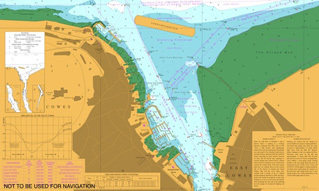 Numerical tidal simulation of Cowes Outer Harbour. The animation illustrates a representative spring tide after the construction of the new Outer Breakwater. Higher tidal flow speeds are shown as lighter colours. The water level plot shows the water level as predicted for Cowes.